Need accessibility help for your website? Look no further. 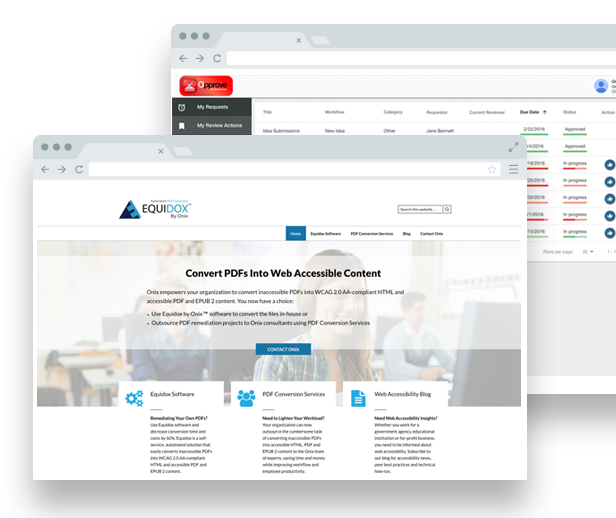 We empower your organization to meet the digital accessibility needs of your students, customers and employees. Use Equidox by Onix™ software to convert inaccessible files in-house. Outsource PDF remediation projects to Onix consultants using our PDF Conversion Services. Utilize our Digital Accessibility Services to break down all the barriers to information access. Forget complicated workflow tools or programming. You can streamline any approval process with ease to increase organizational efficiency with Opprove. Simply create a workflow, select an approver — and if necessary, attach a file from Google Drive. This billing analytics tool empowers you to effectively manage the usage, budget and billing processes associated with your Google Cloud Platform accounts and projects. OnSpend helps you increase cloud efficiency and reduce usage waste.